On Friday August 11, 2017, Nacra Sailing issued a recall and sent it to all foiling boat owners as well as the class executive. The recall notice is included at the bottom of this communication. Two test foils broke about 6 weeks before the first delivery of foiling equipment. These breaks were of the prototype foil design, and occurred before production began. The cause was an unplanned for failure mechanism that occurs when the boat is heavily loaded to leeward and then the windward foil catches. This occurs primarily when the leaps out of the water and gets push downwind, then putting the full force of motion into the typically unloaded side of the windward board. These first breaks were at the inside of the elbow of the daggerboards. The foil was redesigned to account for breakage at this area, and we have not seen failure there so far. The current cassette, photographed above, is the same concept of design as used in the A-cat 4-point filing designs. It is made from an advanced plastic called POM and is a single piece. Due to it’s single piece construction, one side must be very shallow to allow the curved boards to fit though the gaps while maintaining a tight fit in sailing position. As such, the bearing surface on the typically unloaded side is only a 1mm high ledge along the full length of the surface. On the other side, the typically loaded side, the surface has a 19mm high ledge. Upon initial release of the first boards, there were two other major issues with the new centerboards. They had many pinholes, a typical byproduct of the construction technique, that were not sealed. When the boards were sent to the sailors, many of the boards had these pinholes which rapidly filled the boards with water, itself a problem, and it could have caused further problems over time. The second major issue was that the pain (clearcoat) used on the boards appears to have been from a bad batch of paint. It was too soft, too easily scratched, and became cloudy upon light use. After investigating the issues, working with the supplier, and solving some other more detailed and minor issues, Nacra Sailing informed all the sailors that all 180 of the first set of boards would be replaced, free of charge, at the earliest opportunity. Some of those replacements have already occurred. This week, two more boards broke in the same manner as the Swedish boards. On Thursday, Nacra Sailing adjusted their bend/break test rig so that instead of using a broad hold of the exit point of the boards it point loaded them like they are on the boats themselves from the cassette. They were able to reproduce the breakage as seen by the two boards this week and the Swedish board. The point loading from such a small surface crushes the matrix and then it shears through the board, like a knife edge would do on a smaller scale. On Friday Nacra Sailing issued the recall and reviewed options with their design team. The planned design solution scales down the same style of cassettes used on the America’s Cup boats. In order to provide the same 19mm bearing surface as the loaded section, a 2-piece POM cassette, will resplace the current cassettes. 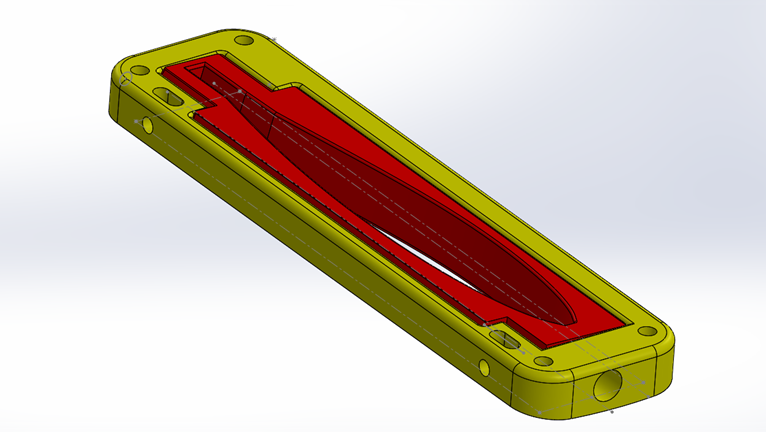 On Saturday the part was designed, the following is a rendering of the replacement part design. 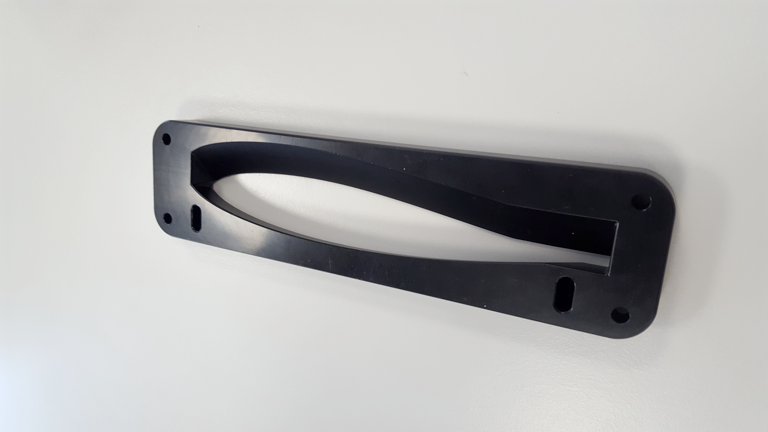 On Sunday, a prototype of the replacement part will be manufactured, and on Monday they will bend/break test the part to ensure it solves the problem identified. Once this test has been completed, Nacra Sailing will issue updated guidance to the sailors affected, especially about the time frame required to build and distribute replacement parts. Note: this recall is aimed to stop teams sailing on a system that has a known failure mechanism. Replacing these cassettes is a simple process that does not require all of the boats to be returned to a factory. The obvious one is will the new design solve the problem, and will there be enough parts circulated for all sailors to bring their boats into the new spec. Assuming the new design does solve the problem, the POM pieces can be rapidly made, and it does seem reasonable that parts should become available. The less obvious issue relates to the breakages themselves. Have the board that are in use been compromised from sailing on this highly loaded surface or is it a catastrophic failure mechanism only. Put more simply, do the boards degrade and then break, or is it a single event that overloads the boards, crushes the matrix, and then the board fails. If there is a chance of degradation, then the same caution that has beach all boats this week continues to hold until all boards are either replaced or ultrasonically examined. There is a lot of pressure on the class to hold a world championship at this point, with teams having booked and paid for accommodations, travel plans, entry fees, etc., and simultaneously there is a requirement that we only hold a championship where the manufacturer can ensure that any recalled parts have been replaced or tested to a suitable level they can be confident of suitability for racing. 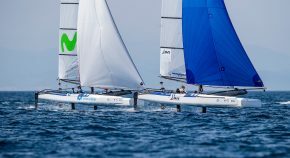 Nacra Sailing will continue to work on technical and production solutions to the problems discovered. By Monday we should have more information about the new design and availability. The Nacra 17 Class will hold an executive meeting following this update, and along with our partners in World Sailing, La Grande Motte (World’s Venue), and class member consultation, and communicate intentions regarding the 2017 World Championship, no later than Wednesday August 16th. The World Championship is currently planned for September 5-10, in La Grande Motte, France. Class President, Marcus Spillane, will continue to update key members of World Sailing as to the developments as they occur. 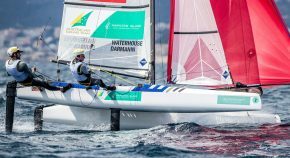 Nacra Sailing is recalling its Nacra 17 Foiling configuration over an issue that could cause the daggerboards to fail without warning during operation. The defect: the daggerboards could fail without warning during operation, causing the daggerboard to break. The issue is potentially increased likely to happen during high winds and/or higher than normal loads. The issue is caused by a problem in the bottom bearing, which does not have enough surface connected to the daggerboards, this is causing extreme high point loads on the daggerboard surface causing buckling and breaking of the board if pushed outwards. The hazards: a failure of the daggerboards during operation could potentially cause sailors to lose control and crash. NACRA SAILING doesn’t have any reports of accidents or injuries caused by the problem. 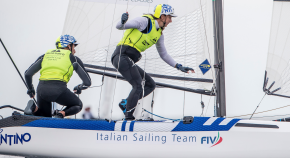 The fix: NACRA SAILING will notify owners, and dealers. Replacement bearings will made available for all customers. The repairs will be performed free of charge. if purchased directly at NACRA SAILING, a set of replacement bearings will be made available for you on the shortest possible timing. We are still deciding on the exact process and timing of exchanging as this is depending on production capacity of the replacement bearings. We are expecting to have first availability of replacement bearings end of next week (18/8/17] and full availability the week after. More details in follow up communication. 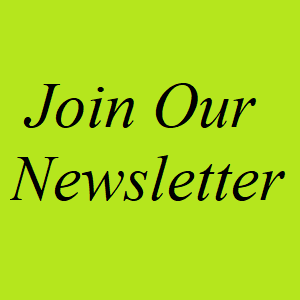 Owners can also contact their dealer or NACRA SAILING with questions by using the following information.